Armour Etching Cream is a special formula that safely and easily removes a fine layer of glass from windows, mirrors and other glass objects to give them an attractive etched appearance. Using contact paper or any craft stenciling paper that has a sticky back you can draw a design, then cut out the portions of the paper that you want to etch. Apply the cream with a stiff utility or craft brush and in 5 to 10 minutes your project will be etched. Instructions are included on the bottle. Note: This offer is for 1 brand new 3oz. bottle of Armour Etching Cream. A safe and simple way to decorate mirror and glass. Be sure to visit our Amazon Storefront to see more related items AND hundreds more products that fit all your craft, art and hobby needs!!! We have the creative component you need!! 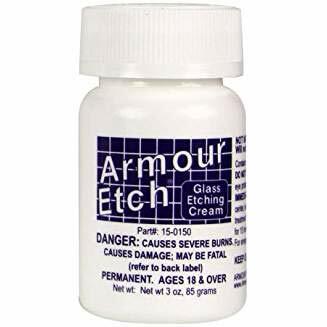 If you have any questions about this product by Armour Etch, contact us by completing and submitting the form below. If you are looking for a specif part number, please include it with your message.